What is a Splash Pad/Splash Park/Interactive Water Fountain? A more recent addition to the recreational water attraction scene is the water play area. These areas go by many names. They may be called an interactive fountain, wet deck, splash pad, spray pad, or spray park. The variety of names depends upon the area. Those spray parks and splash pads that have multiple above surface interactive features are often near a park, playground, sporting avenue, or other area of play. Those with simple jets, jets and lights, and/or jets and sculptures may only be near a city park or in the middle of town. People may, due to the nature of pictures and names, not realize there is no standing water in these attractions. Splash pads are safe, affordable, recreational, zero-depth water attractions that can be installed anywhere including residential backyards, child care facilities (day cares, preschools, summer camps, church camps, etc. ), RV parks / campgrounds, HOA community parks, apartment multi-family complexes, hotels, destination resorts, amusement parks, city parks, and more. Splash pads will typically consist of multiple spray jets, and/or above ground spray features. A splash pad can operate on a fresh water system, a grey water system, or a recirculation system. With little or no standing water (and thus no lifeguard staffing requirements), but a wide range of water-play options, splash pads represent a natural evolution of the backyard sprinkler cool-down concept. There are two approaches to splash pad mechanics: the flow-through system and the recirculation system. In a flow-through system, water from a potable source is pumped onto the pad and allowed to drain into a municipality’s storm system or, quite often, to be repurposed as irrigation. This method requires no water treatment and testing (nor the corresponding expense and staffing expertise). A recirculation system, meanwhile, operates more like a pool — with chemicals, filters and pumps. Water is sent to the pad from a tank roughly four to five times the system’s flow rate. So if the splash pad’s features are operating at the extremely high flow rate of 2,500 gallons per minute, for example, a 10,000-gallon tank is required to allow the system to properly maintain water quality. Minimum tank sizes vary by state. The City of Amory has opted for a non-recirculation type of interactive fountain to be placed in Frisco Park. We have a knowledgeable and very experienced engineer/consultant on our Frisco Park Interactive Fountain project who has seen both types of systems and recommended very adamantly the flow-through system. This system will abolish the chances of water-born illness and spreading of any disease or contamination through our system. The fountain is not the only advancement to our wonderful Frisco Park. We have consulted with MSU extension services regarding the proper types of trees, vegetation, and landscaping materials to have in our historic park. The Amory Flower Lovers Garden Club has also been contacted and will be involved in the landscaping process. Beautiful maintained and well cared for trees and colorful vegetation will be placed throughout the park. The Frisco Park Interactive Fountain project is the only active project occurring in Amory right now for a splash pad, spray pad, interactive fountain, etc. There are wonderful organizations in our community who wish to expand the areas of play that the City of Amory can offer to our youth. These groups are working on a preliminary idea and fundraising project that may happen in the future but is not currently in process. The fountain may go by Frisco Park Interactive Fountain, Frisco Park Splash Pad, or Frisco Spray Park depending upon the event in Frisco Park at the time. An example would be that seniors at Amory High School would more than probably call the area Frisco Park Interactive Fountain during their annual and traditional Senior Walk. 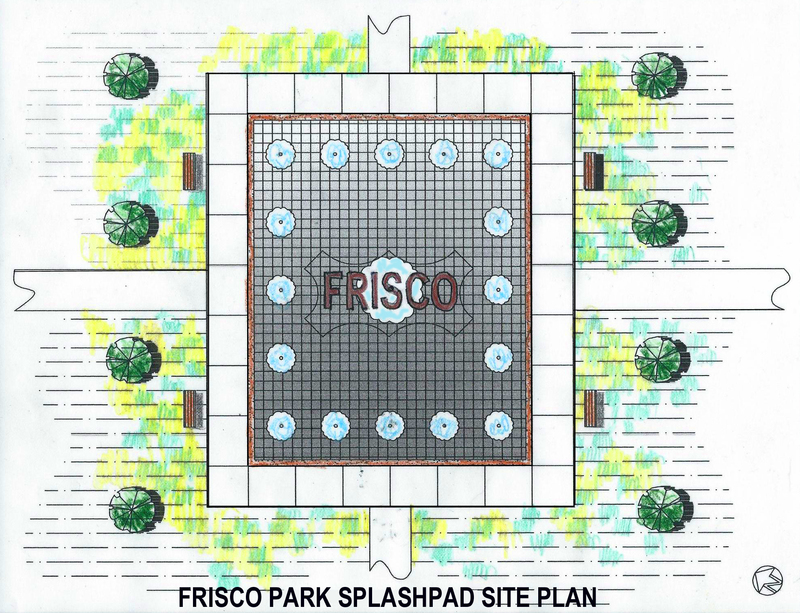 Children and parents who will surely enjoy the park during warmer Mississippi times will more than likely refer to it as the Frisco Park Splash Pad. Call it what you may…as long as you have a great time enjoying our park and the great Mississippi outdoors, we are happy for you to call Amory home …if only for a visit to our historic Frisco Park. The City of Amory will be releasing quotation specifications for the concrete covering/coating separately. Please visit again for updates. All Quotes/Bids are due to the City Clerk’s office in City Hall on March 2, 2015 at 2:00 p.m to the attention of Jamie Morgan. ALL quotes/bids must be marked on the outside of the envelope as Frisco Park Splash Park. Please see below to see the updates on the Frisco Park construction and Interactive Fountain project. City of Amory Awarded Grant Through the Mississippi Department of Wildlife, Fisheries, and Parks Outdoor Recreation Grants Division and the Land and Water Conservation Fund Project! 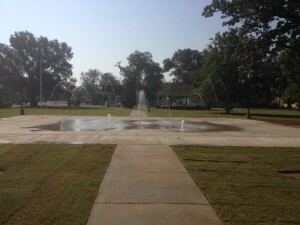 The Frisco Park has been home to the three spray fountain since 1972 when the City of Amory received a grant from the Open Space HUD Program for beautification projects. Frisco Park had a bandstand located near where the current fountain is until it was torn down in 1972. 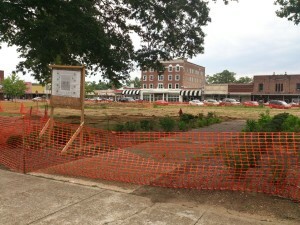 The bandstand was removed to make room for sidewalks to the fountain that would be created in the center of the park. As part of the beautification project parking lots were added around city hall, the area surrounding city hall was landscaped, a fountain was created, and more. The fountain was a centerpiece for the park and meant to be an artful point of interest. The citizens of Amory and Monroe County have enjoyed our park and fountain for many years. The fountain has served as a gathering place during festivals and events, and it added to the beautiful park for citizens seeking a pleasant stroll or invigorating walk on a mild day. 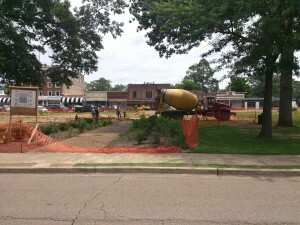 The City of Amory has been blessed to have such a park and an area of beauty such as the existing fountain. The fountain has always been an aesthetic fountain and not an interactive fountain. The fact that children and adults entered the fountain although there were signs warning of electrical shock is what led to the search for a functional replacement. At the August 21, 2012 City of Amory regular called board meeting, the aldermen created a committee tasked to replace the City of Amory Frisco Park fountain with an interactive fountain to be enjoyed by our citizens. This was part of an ongoing project that would circumvent the funds not found through grants. 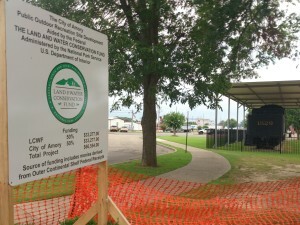 Since April of 2011, the City of Amory and City Clerk’s office have been tirelessly trying to find grants to help pay for the interactive fountain that would replace the existing fountain in Frisco Park. 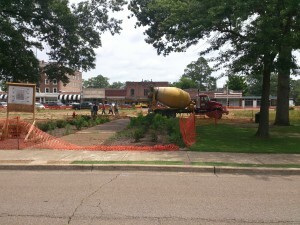 In 2013, the City of Amory entered the Coke Take it to the Park challenge to try to get the fountain funded. The City of Amory placed 19th out of the 11,600 parks who entered and participated in the competition. Citizens were asked to use FourSquare to check into the park and use the Map My Fitness application to track exercise. The number of times per day and number of minutes spent exercising counted as voting for your park! The community rallied behind this effort. In March of 2014, the LWCF grant through the Mississippi Department of Wildlife, Fisheries, and Parks reopened a grant project through the Outdoor Recreation Grants Division that had not been funded since 2005. 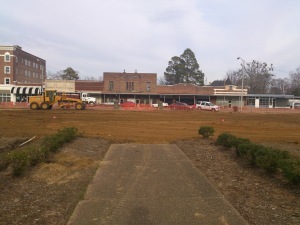 The City of Amory learned of this grant through a grants website email that we receive daily and later through communications with Three Rivers Planning and Development District. In cooperation with TRPDD, the City of Amory applied for the grant. In April of 2014, the City of Amory used social media and the Monroe County Journal to promote a challenge to our citizens of raising $40,000! If the citizens would donate that much, then the city would match it. However, because we have received the grant, the citizens’ donations will serve, in conjunction with city funds, as the match. The City of Amory is still taking donations via GELI Foundation in Amory to finish our project. Demolition will begin very soon followed by construction in the Spring and Summer of 2015. Thank you to the citizens of Amory and the surrounding area who have supported this! Pictures of the prospective fountain will be loaded soon! 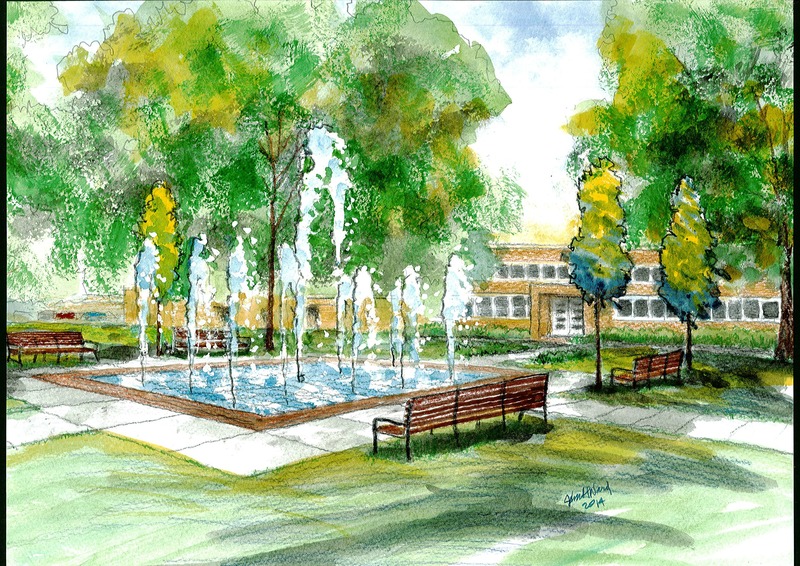 The following is an artist’s conceptual drawing of Frisco Park after the fountain installation courtesy of Mr. John Ward. The following photos are concepts. The final design may vary. This is a concept drawing of the overhead view of Frisco Park. The final design may vary. 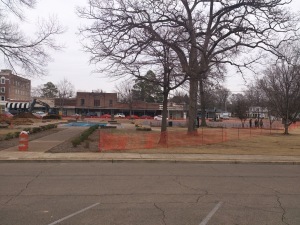 The park is finished and open to the public 9:00 a.m. until 8:00 p.m.
As of February 3, 2014, the Frisco Park in Amory Mississippi has become a construction zone. 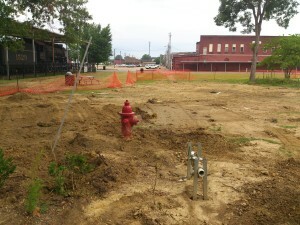 Please be aware of the areas that are roped off for construction for the creation of a beautiful playspace and water feature to benefit the citizens of Amory. Please do not go into the construction fencing area to view the progress. This is a construction area and, therefore, dangerous. Please be patient with our City of Amory employees as we progress through the demolition portion of this project and phase into the construction process.